SUMMARY: Autobiography of a family dog narrated by the family dog himself. AUDIENCE: This book was written for entertainment, not education. It is written without jargon and does not require an academic or technical background. Any owner can pick it up and enjoy it. 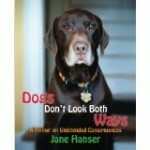 The author: The author, Jane Hanser, does not have a professional or academic background in dogs or dog behaviour. She wrote the book as the owner/guardian of the protagonist, and as a published author in her own right. Style and contents: The book tells the Boston misadventures of Joey, the chocolate Lab. It was a written in a breezy, lively, light-hearted voice with the dog himself as narrator. Joey is an incredible well-socialized dog who loves all: strangers, vets, children, crowds, you name it. He does have one flaw: a bad case of wanderlust. In the arms’ race between the family’s efforts to secure the yard and the dog’s Houdini-like escapologies, Joey always seems to find a breach and go wander. Until one day things go wrong. And the family is left to pick up the pieces of that particular escapade for months on end. Reading the book as a professional, a couple of mismanagement issues bothered me: letting him accompany his jogger Dad for morning runs as a young pup, and letting him spend his time unsupervised in the yard. These are classic no-no’s. They are asking for trouble: increased risk of hip dysplasia and behaviour problems, respectively. I was also bemused by the misunderstanding around the clicker (thinking it a recall cue) and other training basics. Who knows where the wires got crossed, but a basic dog training class could have dispelled a few of these misconceptions easily. As a professional, I also wondered why they didn’t contact a behaviourist about his Houdinism. It was a stark reminder that we still have a lot of work getting the word out there: we – are – affordable – and – we – can – help. They could have spared themselves the accident and everything that ensued had they sought professional advice about the escape attempts early on. Still it is refreshing to read an honest account of life with a family dog, flaws and all, away from the cold perfectionism of professional advice. The verdict: Let me precede this by reminding you: it is a matter of personal taste. But…. Books that set the dog as narrator make me want to scream in horror. As a scientific skeptic looking for facts, facts, facts; the speculation and Disneyness of it all set my teeth on edge. If you are looking for the next textbook to sink your teeth into, walk right along. But if you want an entertaining read featuring a charming family Lab, it could be just your thing. Browse the Book Review archive. Genre: autobiography. Book Authors: Bracker Kiko, Hanser Jane. Reading Level: Owners. Star: 2. Bookmark the permalink. Post a comment or leave a trackback: Trackback URL.